Houdini's Milk Can, a packing crate, and his original East Indian Needles can be seen as a part of Magic! The Science of Wonder at The Houston Museum of Natural Science. The exhibition opens today and runs through Sept 6. Check out this pretty cool promotional video below. For more information, visit Magic! at HMNS. Filmed in Los Angeles and Catalina Island in 1919, Terror Island finds Houdini playing philanthropic inventor Harry Harper who sets out to find the missing father of a beautiful heiress (Lila Lee) on a South Seas island populated by cannibals! The series continues on March 11th with a screening of The Man From Beyond. It will conclude on March 25th with Haldane of the Secret Service. All showings start at 5:30pm and are free. 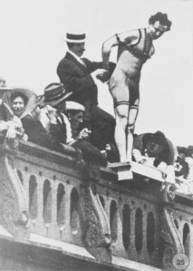 As Australia gears up to commemorate Houdini’s first flight on that continent 100 years ago, the Geelong Advertiser remembers another Houdini feat from that same tour -- his jump into the Yarra river from the Queens Bridge in Melbourne. Noel Murphy writes about the escape which took place 100 years ago this week. It’s a good, detailed article well worth a read. 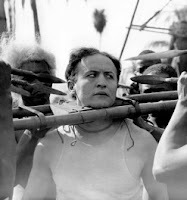 Interestingly, the article suggests the story of a corpse surfacing beside Houdini is apocryphal. Is this Houdini in death? 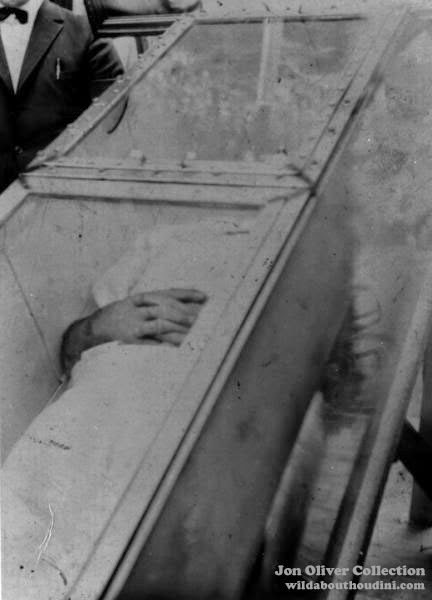 “The photo is of the dead Houdini in the coffin he used in Worcester, the one that didn't go back to New Jersey with the rest of the props. In the photo [...] Houdini is dead. You can clearly see his hands, and I recognize them. You can also just make out his nostrils. It must have been taken either before the body was shipped from Detroit or after it arrived in NY and was placed in the bronze coffin." Patrick says he received the photo from Jon Oliver. “Jon Oliver is a Michigan magician/escape artist who is very knowledgeable about Houdini. He persisted in trying to get to know Houdini relatives like Ruth Kavanaugh and Harry Hardeen, and, eventually, they talked to him. Quite an eerie, and grisly, discovery. UPDATE: It's now possible this is a photo of Houdini (alive) performing a publicity stunt in Worcester MA in 1926. Click to read: Uncovering Houdini's THIRD air-tight container test and death casket.